The Lectionary readings for Transfiguration Sunday, Year B converge upon the ascension of Elijah the Prophet in a whirlwind, and the Transfiguration of Christ on the mountain with Elijah and Moses, the “law and the prophets”, present. This litany is inspired by those readings and a prayer for us to experience transfiguration, change toward heaven, in the here and now. God, let your kingdom come on earth. Grow, spread, and bear fruit. Let Heaven and Now converge. The source of all life. And fills us with radiance. This litany is inspired by the account of Christ casting out unclean spirits in the Gospel lectionary passage for the week: Mark 1:21-28. To deal with unclean spirits decisively. We exercise power in love. When we have passed through it. This litany contains references to selections from the Lectionary texts for January 21, 2018 (Year B). The old is passing away. There is suffering, hunger, and war. In our government, society, and streets. To the mystery of Christ within us. Beyond the screen of what our eyes can see. The account of the calling of Nathanael in John 1 (Lectionary for Second Sunday in Epiphany) has fascinated me for many years. I’ve never been able to definitively puzzle it out. But the narrative of it draws me in. I can imagine how Nathanael might have felt, waiting, hoping for something; perhaps all his life. Perhaps events in his life made him cynical. Perhaps he chose to watch from the edges, partially hidden. Perhaps he thought he’d never been seen, and had given up hope of being seen. Perhaps he’d lost so much he thought he’d never be found. It seems like he and Jesus have a secret exchange here, buried in the dialogue. And whatever it is, it seems to be what he needs, because we can feel Nathanael’s heart open and his guard drop, simply from knowing that Jesus has seen him. It occurs to me that this is part of what Epiphany means: we get in on the secret that God sees us as intimately as Christ saw Nathanael. We want you to see us. We want Someone, Something powerful to take an interest in us. For a flame to kindle. We can rely on you to know the truth of us. We can trust your mercy. We have seen the truth of you. Epiphany is celebrated on January 6, after the twelve days of the Christmas feast. 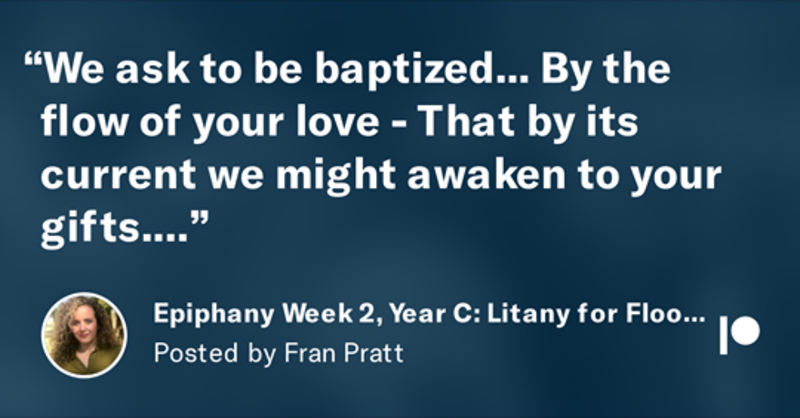 This litany incorporates references from the Matthew 2 and Isaiah 60 passages in the Lectionary for the feast of the Epiphany. I've also included some additional references. People who waited and looked. A yearning for your kingdom. Transfiguration Sunday marks the end of the season of Epiphany. The season of Lent follows. Transfiguration Sunday celebrates the day in which Jesus was confirmed by God as divine before the apostles. The Lectionary passages for the day tell the story, as well as its precursor story, that of the transfiguration of Moses in the book of Exodus. In an unexpected appearance, Moses himself is also witness to Jesus' transfiguration as described in Matthew 17. More than any pastor, politician, or world leader. We will look to you. In this section of the Sermon on the Mount in Matthew 5, we hear Jesus saying that what happens in our interior lives matters just as much to our wholeness as what we manifest in our behaviors. Our thoughts have weight, and we must be just as ruthless in weeding the bad ones out as we are to keep ourselves from harming others overtly. Is as important as what manifests outside us. In action done, or left undone. Forgive us for the violence inside of us. Help us to re-frame our problems in actionable terms. Help us to re-train our brains to joyous thinking. Both within our minds and outside of them. Is only life and light. This litany is taken directly from Isaiah 58, Psalm 112, and from Jesus’ Sermon on the Mount iMatthew 5. Each of those is part of the Lectionary selection for the Fifth Sunday of Epiphany.